Bannister Lake announced today that it is fully embracing the NDI® workflow with its powerful Chameleon data aggregation solution. For producers working within the NDI ecosystem, Chameleon provides a straightforward method to bring live data directly into their productions. Chameleon reads multiple data sources, including news, weather, sports, traffic, social media, and financial data content, allowing users to edit, moderate, and customize their data. Using Chameleon’s Query functionality, data can be parsed at a granular level, enabling producers to select subsets of data to target viewers. The solution automates the flow of data to endpoints, ensuring that content is consistently relevant and timely. In turn, using Chameleon’s RESTful API, data content can be reformatted for distribution to virtually any device or endpoint. 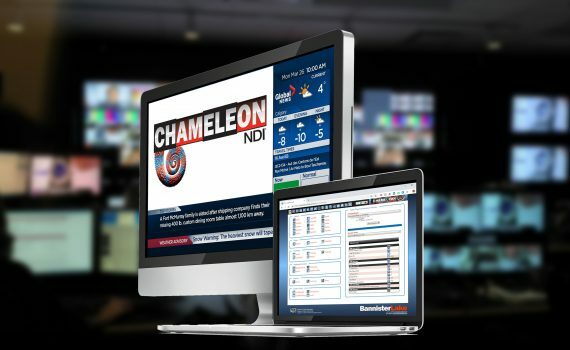 Chameleon also extends NDI well beyond broadcast as a data aggregation solution for eSports and digital signage, providing producers with new business opportunities. eSports events — broadcast, streamed, or in-venue — benefit from Chameleon’s ability to read and display important game-related data feeds and provide fans with score boards, player profiles, standings, and other key data. Live data is an integral part of digital signage, keeping viewers updated with the latest news and information. Bannister Lake will be at the 2019 NAB Show, Booth SL5616.